Victory Correctly Predicted By: Himself, Naetor, bosskamiura, and LORE. What achievements were you chasing with the deck that you used? What other achievements did you consider chasing? I was looking for the Data of Borg win achievement (he never entered play). I didn't really have any particular achievements that I was looking for (the attribute-based decks other than Strength I haven't finished making yet). Frankly, I'm not sure if there was any specific achievements that I could get that would've won this tournament. Any deck that couldn't deal with walls as that's all I was running (other than skeleton crew and timescale) is what I didn't want to face. Didn't want to see Starfleet Trellium-D either (since I normally do two space missions). Beyond that, I was okay dealing with most anything else. I hadn't played a deck like this one before but I had played against someone else's version before - Matt Slade played with this idea in London during Day 2 of Worlds. I ended up winning that game but I was intrigued by it. I had talked about it off and on (you should see the number of deck premises I have in the deckbuilder or on paper). Like most decks I play, they aren't playtested and so I'm always learning more and more while I'm playing them and how to make them better. Overall MVP - Borg Queen swapping and the keyword - Interlink. Without these two cards, the deck doesn't work. Now to see what to play next. After the errata to Quintessence and Fifth, it feels like many people in the community wrote off Borg Solvers. They don't get played often, and win even less often. 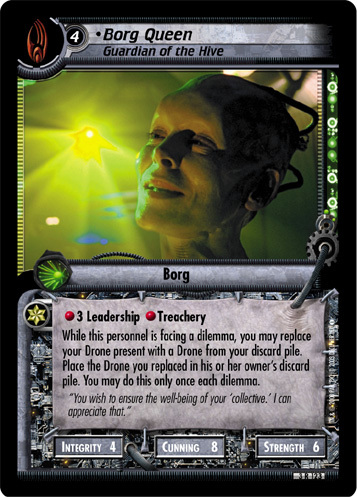 The only Borg Solver I can recall writing about in the last few years of this series is Greg Hodgin's 2018 Atlanta Regional winner (which appears to be a relative of the deck of Mr. Slade's that MVB mentions). That deck inspired me to try a Delta-based version at Texas Chainsaw Masters 2 and, while it felt powerful, I could only take it to fourth place - I couldn't quite answer all those Cardassian decks. 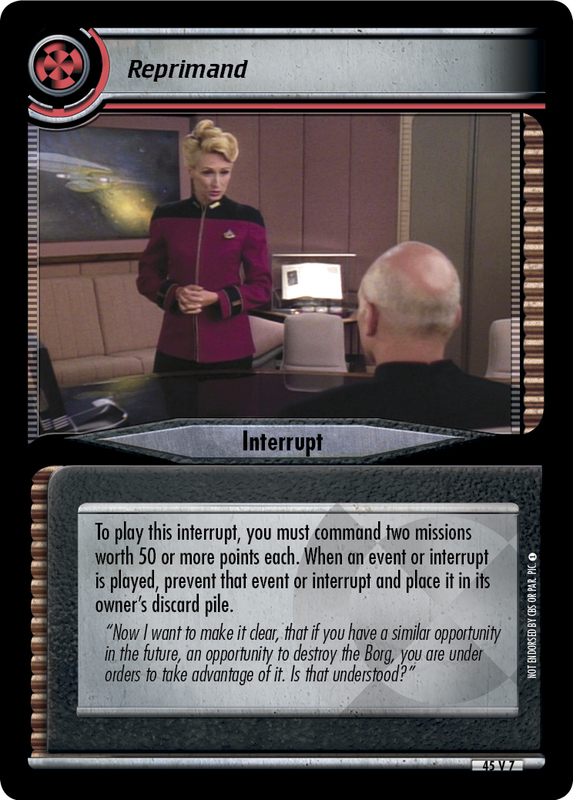 That brings us up to Michael's deck, which also takes Borg Solvers to the Delta Quadrant, but looks much more refined. Starting with the dilemma pile, it's a tight 30 cards (even tighter than Slade's 34 cards), making it more likely he'll draw into just he wall dilemma he needs, when he needs it. All of these decks run the traditional Borg wall dilemmas (Tactical Disadvantage and Back to Basics), because they're so easy to set up. Just rush to that first mission, interlink at least fourteen personnel and ships, and that covers Back to Basics, and holding a single Cube will often be enough to win any Tactical Disadvantage fight (sorry MVB). What Michael and Slade add to the equation are Divide and Conquer and Qualification. It turns out those dilemmas are just as easy to activate while you're fueling Back to Basics. When I was playing my version, I discovered that, if I didn't draw my interrupts early, I wouldn't draw them at all, since they wouldn't get shuffled back in with Back to Basics. In fact, Michael had to interlink all the way down to his second to last draw deck card to get the honor Drone in our game, which milled every single one of his interrupts. That's unfortunate - all those Borg interrupts are quite powerful. Those two dilemmas, however, turn that disadvantage but boosting their attribute requirements to incredible heights. No one's getting through a dilemma that requires 120 strength without something like Bridge Officer's Test. Which brings us to the other major upgrade this deck has over the other decks I've mentioned: oodles of interrupt prevention. In addition to the under-appreciated Reprogrammed, this deck also runs two 50 point missions in order to activate Reprimand. Even better, because Destroy Transwarp Hub has those 35 point Borg requirements, Michael doesn't actually have to solve one of those brutal 50 pointers. It does mean that he can't use the ubiquitous Alpha 5 Approach, a problem which MVB solves with 2 copies of Skeleton Crew. It's often a big ask to include dilemmas that do nothing to stop the active attempt, but when most of the dilemmas in the pile are designed to stop attempts on their own (walls), it's much easier to include dilemmas like that.